In order to sustain a high frequency resonator, the traditional swiss lever escapement had to be rethought. Increasing regulating organ’s frequency requires apparently more energy to sustain the oscillator. Four key points related to reduce energy consumption: Reduce oscillator’s weight or inertia, Reduce oscillator’s amplitude, Increase oscillator’s Q factor, Improve energy transmission’s efficiency in the gear train and escapement. 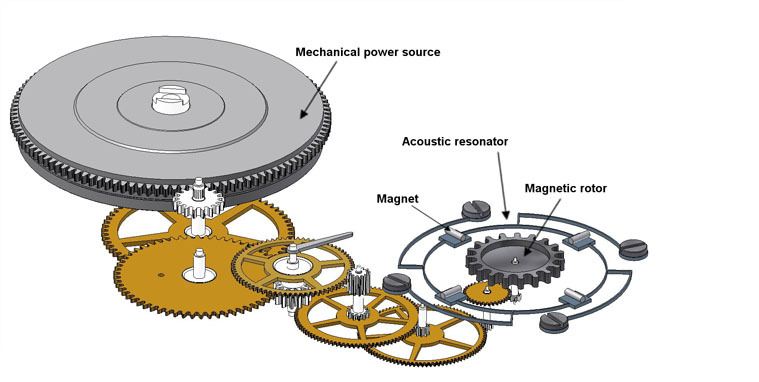 Classical swiss lever escapement would consume far too much energy at high frequencies. Consider that the lever and the whole gear train up to the barrel are accelerated and stopped at each oscillation of the regulating organ. Reducing weight might improve the efficiency, however each acceleration and stop requires energy. At high frequency it will present a lot of waste. This is not even taking into account shocks and frictions, bringing down the energy efficiency to an insignificant level. The Résonique had to reinvent the escapement. An escapement where energy is no more transmitted in tiny intermittent impulses but in a continuous sinusoidal form. No more abrupt mechanical stops but a smooth and continuous transmission will definitely improve efficiency. One of the De Bethune’s discoveries is the use of a magnetic escapement that allows such a sinusoidal transmission. A mechanical power source is transmitting torque to the wheel train ended by a magnetic rotor. The rotor is transmitting energy to the resonator via permanent magnets. Therefore, wheel train’s rotational speed is synchronized according to the resonator’s natural frequency. As the regulating organ, the resonator determines the time unit. Hands being attached to the gear train, their speed are controlled by this accurate time division. The trio model rotor, resonator, magnets brings the escapement function, energy transmission to the timekeeping element and oscillations counting. The rotor is transmitting energy to the resonator via permanent magnets. The resonator vibrates and resonates with the rotor spinning thus controlling the wheel train’s speed. The rotor’s speed is getting synched by the resonator’s oscillations, a continuous counting is carried out. For every rotor’s tooth passing, there is one oscillation. The resonator’s vibrations are sustained to its natural frequency as long as the main power source is providing sufficient energy. Oscillations’ amplitude can be considered as constant during total operating time. To meet high frequency’s constraints and needs, the classical balance-spring has been replaced by acoustic resonators. No more pivots, affecting Quality factor improvements with frequencies increases. The developed resonators only have a few fixed or pinned points; they are stiffer and therefore allow the use of their natural modal shape. Having short amplitude brings a much higher Q factor and better regulating performances. Keeping amplitude short means, firstly, remaining in the elastic regime and therefore preserves isochronous factor, secondly, reduce air resistance proportional to speed and distance travelled. Regulating organs developed by De Bethune are called acoustic or sonic resonators because they are in the audio frequencies range (20 Hz – 20 kHz). They can be highly varied in terms of shape and vibrating mode as long as they are balanced, having a high Q factor and having a stable natural frequency.